Well in 2013, the directors at the company needed help with how to market themselves being new to Scotland and the came to us to collaborate on an expert social advertising campaign. Where other social media firms found it difficult to create content without a bit of toilet humour, one of our social gurus Angela has experience writing and campaigning for high luxury interior designer brands in New York City. Take a look atsome of our sample posts below. At the start of the new year, interior design firms all across the UK participate in a lavish January Sale to attract new business for those who are thinking about remodelling or building their new homes. This year, in order to compete with similar companies, BAGNO was worried that they would need to spend over £1k in print advertising, £5k in radio ads and then have some leftover budget for targeted ads on social. That's where we stepped in and said we can run your most effective marketing campaign with 1/12 of that budget. We ran a killer competition that ran the majority of the sale month to attract thousands and we mean THOUSANDS of new fans, followers and most importantly new business through the success withinour Facebook marketing strategy. The end result for our client was a 5x more profitable January for our favourite bathroom company. The best part about this year's success was it was the same campaign (with minor tweaks of course) than last year's. This year, they dropped the expensive traditional marketing ads and invested solely in social. If it ain't broke, don'tfix it. 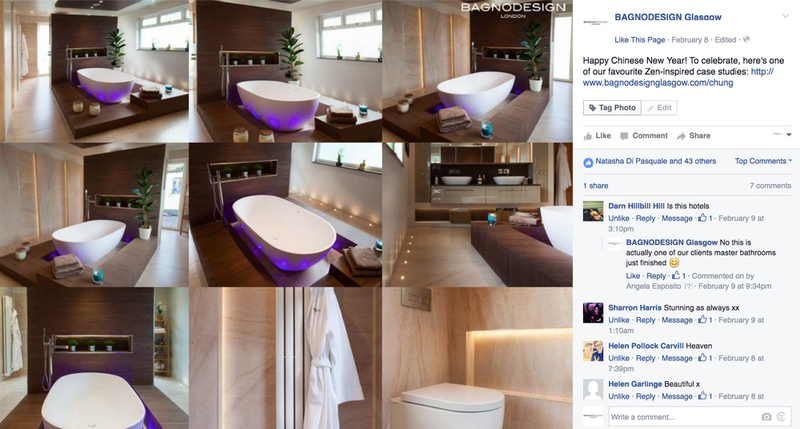 Recently, two of BAGNO's now clients found the designer bathroom shop on Facebook and fell in love with theirwork and dare we say beautiful stories and content. BAGNODESIGN actually originated in Dubai, so before even stepping foot inside their local BAGNO, the two fans made sure to visit BAGNO showrooms while they were in Dubai. After loving what they were seeing both online and in Dubai, they came into the Glasgow showroom, were designed four bathrooms that absolutely exceeded their expectations and is now one of their biggest and most beloved clients. Social media can sometimes be a long-term process, but wow what a result! !